This book visits the fact that, in the pre-modern world, saints and lords served structurally similar roles, acting as patrons to those beneath them on the spiritual or social ladder with the word "patron" used to designate both types of elite sponsor. 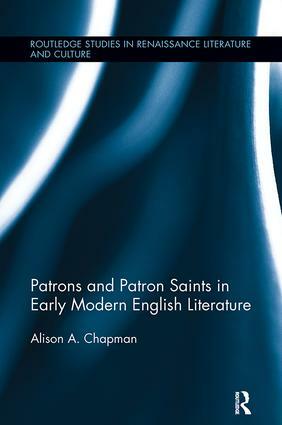 Chapman argues that this elision of patron saints and patron lords remained a distinctive feature of the early modern English imagination and that it is central to some of the key works of literature in the period. Writers like Jonson, Shakespeare, Spenser, Drayton, Donne and, Milton all use medieval patron saints in order to represent and to challenge early modern ideas of patronage -- not just patronage in the narrow sense of the immediate economic relations obtaining between client and sponsor, but also patronage as a society-wide system of obligation and reward that itself crystallized a whole culture’s assumptions about order and degree. The works studied in this book -- ranging from Shakespeare’s 2 Henry VI, written early in the 1590s, to Milton’s Masque Performed at Ludlow Castle, written in 1634 -- are patronage works, either aimed at a specific patron or showing a keen awareness of the larger patronage system. This volume challenges the idea that the early modern world had shrugged off its own medieval past, instead arguing that Protestant writers in the period were actively using the medieval Catholic ideal of the saint as a means to represent contemporary systems of hierarchy and dependence. Saints had been the ideal -- and idealized -- patrons of the medieval world and remained so for early modern English recusants. As a result, their legends and iconographies provided early modern Protestant authors with the perfect tool for thinking about the urgent and complex question of who owed allegiance to whom in a rapidly changing world. Alison Chapman is Associate Professor of English at the University of Alabama at Birmingham, US.